- Available in Different Colours and Design. We Manufacture this COPPER NECKLACE SET on make to order basis choice of metal polish & colour of stones available. With years of experience and expertise in this domain, we have emerged as an affluent supplier of Copper Necklace Set. 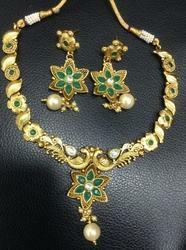 Additionally, clients can avail this necklace set as per their needs at affordable price. Designer Copper Finish Necklace Set For Ladies with Copper Glass Stones and Maroon Glass Stones and Maroon Pearls. 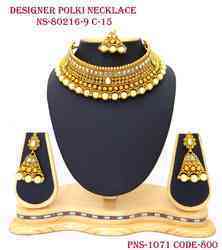 With far-reaching knowledge in this province, we are indulged in providing a supreme quality scale of Copper Necklace Set. This Copper Necklace Set features a classy look a combination of white and blue stones. Our company is involved in offering highly valued Modern Copper Necklace Set.